Wolverton railway works was established in Wolverton, Buckinghamshire, by the London and Birmingham Railway Company in 1838 at the midpoint of the 112 miles-long route from London to Birmingham. In 1865 Wolverton was designated as the LNWR Carriage Works, eventually becoming the largest carriage works in the UK and In 1901, Wolverton was the first railway works to use electricity for lighting and driving machinery throughout and had a workforce rising to 4000 people. Post-war it continued its carriage construction work, including making large numbers of the all-new British Railways Mark 1 carriage, until the intervention of Dr. Beeching. In 1962, the works was downgraded to a repair facility, with the last new vehicle being completed in 1963. By 1964 the workforce had dropped from 4000 to 2000. More recently in February 1986 British Rail Engineering Limited split into two new groups, with Wolverton becoming part of the new BR Maintenance Group, which reduced staff to 850. Following ownership by Siemens Babcock, Alstom, Railcare and Knorr-Bremse, the new company is now owned by Mutares AG and operates under the name of Gemini Rail Services and offers a full range of market leading vehicle overhaul and modernisation services. “We are very proud of our history as a group. Our people come from some of the leading names in the Rail industry, and their expertise and experience is continued in Gemini Rail Group”. 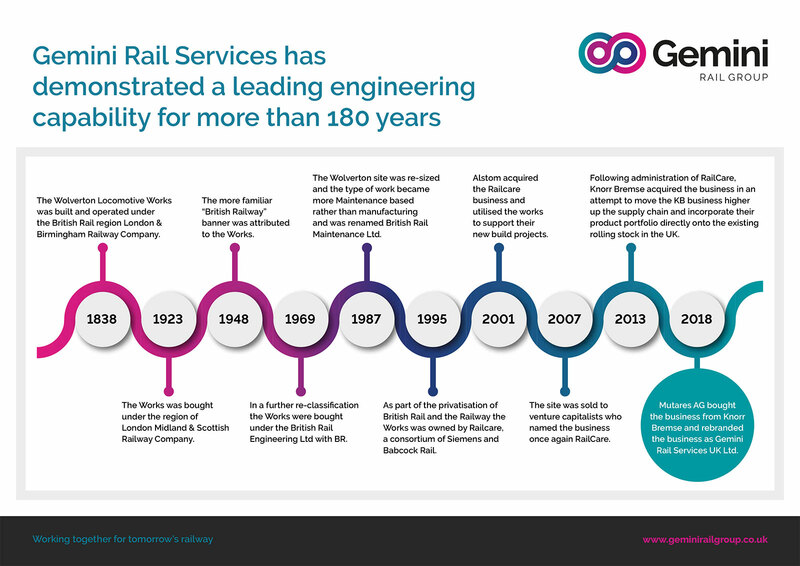 Gemini Rail Technology (GRT) is a specialist rail vehicle engineering and turnkey project management company, with a history dating back 25 years. 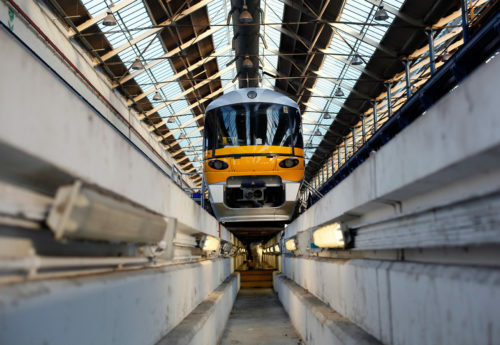 In the mid-1990s the Company, then known as Hunslet Transportation Projects Limited, evolved from a supplier of new-build rolling stock (Class 323) to become a provider of rolling stock upgrade services in response to changes in the wider rail industry at the time. The organisation was later reformed and traded as Transys Projects Limited until its acquisition by the Vossloh Kiepe group in 2012, at which point it was renamed Vossloh Kiepe UK Limited. Following acquisition by the Knorr Bremse Group (KB) in January 2017, the organisation was renamed Kiepe Electric UK Limited (KEUK). 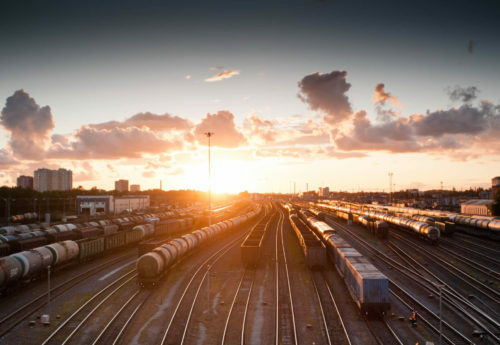 Most recently, KEUK, along with Knorr Bremse Rail Services (KBRS) were acquired by Mutares AG and rebranded as Gemini Rail Group (GRG). After the abolition of LMS with the formation of British Railways in 1948, the works remained the primary Scottish repair centre until 1986 when, under British Rail Engineering Limited (BREL), locomotive work in general was being run down. In 1972 it was renamed from St Rollox Works to Glasgow Works. Part of the site was occupied for a time by MC Metals. After BREL was privatised in 1988 the site was operated as a rail maintenance facility by British Rail Maintenance Limited (BRML) along with Eastleigh, Doncaster and Wolverton. This facility was still a Nationalised Industry. During this period the site was reduced in size and the surplus land was sold off. In 1995 BRML was privatised and the site was sold to a Babcock International/Siemens consortium along with the Wolverton site. In 2002 it was sold to Alstom. In 2007 Alstom sold the site to RailCare. RailCare was purchased by Knorr-Bremse, who subsequently sold it to Mutares in December 2018.